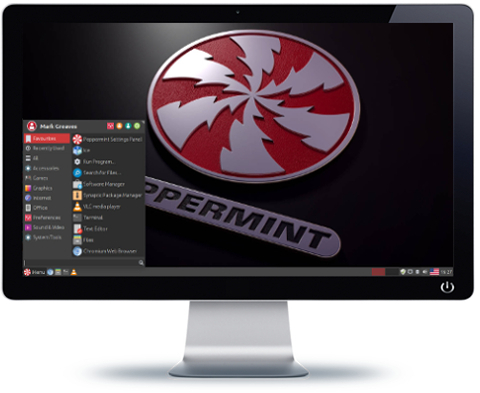 Team Peppermint are pleased to announce the latest iteration of our operating system Peppermint 8 Respin which still comes in 32bit and 64bit versions with the 64bit version having full UEFI and Secureboot support. Whilst a respin is generally a minor release intended as an ISO update, the Peppermint 8 Respin does contain some significant changes. Nemo 2.8.7 updated to Nemo 3.4.7 which seems more stable during large file operations, and now has a separate process for controlling the desktop. OpenVPN updated in the repos to version OpenVPN 2.4.4 to support mixed mode IPv4/IPv6 VPN’s. Switched from lightdm-gtk-greeter to slick-greeter. So a new much prettier login screen, and a GUI utility in the menu called ‘Login Window’ for login screen settings, including the ability to add/change/remove an autologin user. Added a desktop right-click “Open Peppermint Settings Panel” context menu item. We noticed that people who borked or deleted their xfce4-panel had no easy way to get to the Peppermint Settings Panel so they could use the panel reset function to recover, now they can by right-clicking on the desktop. Installed mint-translations, so included mint applications are now available with non-English translations. Fixed peppermint-proxy-configuration on the 32bit ISO. Advert Blocker reinstated by request, available in the main menu not in the Peppermint Settings Panel. New “Pepirus” xfwm4 theme similar to the Peppermint 7 xfwm4 theme but the active window has a light grey border instead of blue, and some small colour tweaks. Most users said they preferred the Peppermint 7 window borders to the Peppermint 8 ones, so this is a ‘similar’ but updated theme. New “Pepirus” icon theme with red folders, and additional icons. New “Pepirus” Gtk theme similar to Peppermix-7-Dark-Red to fit with the new red icon and xfwm4 themes. Changed default wallpaper to Peppermint-3D-Logo-Alternative. Three additional Ray Bilcliff wallpapers. Disabled Gtk overlay scrollbars, so the scrollbars don’t overlay other window content making it difficult to see. Repository now contain tweaked versions of screenfetch and neofetch with custom Peppermint logo ASCII art. Slightly larger terminal window defaults so neofetch/screenfetch have the room necessary to display properly. Started adding non-English translated versions of ICE to the repos .. more languages will be added later as we create them (we’re putting in a lot of effort into having full non-English translations for ALL applications hopefully by Peppermint 9). ISO’s now contain all 16.04 updates (to the date of the ISO) .. so the Peppermint 8 respin ISO’s ship with the 4.10.0-40 kernel from the HWE, which will automatically roll onto the 4.13 kernel via the update-manager when the HWE updates upstream (probably around February). I should probably explain here that some people have suggested the 4.10 kernel series is no longer supported, whilst this may be true for the vanilla kernel please rest assured the Ubuntu 4.10 kernel from the HWE (as used here) is fully supported upstream and will be until you’re automatically rolled onto the 4.13 kernel). at the same time, or you won’t be able to move any desktop icons .. when both are selected desktop icons are locked in place. So no need to add a PPA. It sure is my brother Hippie, specially with the hammering the servers are currently getting. Can I upgrade or do I need to download and burn the respin to a usb stick and then install it? And the link to release notes doesn’t work. So if I understand you correctly, there will be a upgrade to 8 respin in the near future, but due to the manic circumstances, it’s delayed? If so than I will wait. I’m a patient man. BTW keep up the good work, I’m really enjoy using the Pep. It’s fast, stable and looks absolutely fantastic. A big compliment to all who are involved for making the Pep. Googled quickly did not explain what “HWE” means. Somehow linked to Canonical? Then why not use: “http://kernel.ubuntu.com/~kernel-ppa/mainline/” ?? “Kernel 4.13” is no longer the latest Ubuntu kernel. ATM version 4.14.4, with new “stable” versions every week, with the latest bug releases. I’m with English Bob, please make peppermint 9 to automatically upgrade to next version instead of clean install. Is peppermint 8.5 still heavily dependent on the online internet for nearly every app? Also could you put obs into the distro? Thanks for your great work Mark Greaves! Remember !g brings up internet to google. I’m afraid that may not be possible, unlike other distros that stick pretty much with a standard DE we chop and change a lot of components that weren’t meant to work together in the first place, this can introduce issues where config files are left in your home folder that conflict with changes we’ve made in the new version .. now we could possibly script the update to remove these config files, but we NEVER make changes to users home folders because that might not suit everyone, and/or might undo user customisations .. we just don’t see it as our place to mess with user settings. If it turns out it can be done without changes to users home folders (which will depend on what changes we make in Peppermint 9) then we will do so if possible, but as each Peppermint release is based on an LTS so could be used for years anyway I’m afraid it’s not a priority. Is peppermint 8.5 still heavily dependent on the online internet for nearly every app? Peppermint has never been dependant on the internet any more than any other distro, sure out of the box it utilises internet applications, but this is because it’s our ethos not to choose user applications for the user instead allowing them to install ONLY the applications THEY choose .. you have always been able to easily install offline/local applications in Peppermint. Also could you put obs into the distro? Sorry but we cannot do that, it breaks our ethos of not choosing application software for users and by doing so loading everyone’s system with software the majority wouldn’t choose and/or won’t use. Is there something i am doing wrong when i install? I have two hard drives in my desktop and i am trying to install to the 2nd hard drive which isn’t the drive that first boots the computer. I setup the hard drive, with fresh format, with /boot, /root, swap, and /home logical partitions through the Peppermint installer and when asked to restart for final startup the computer boots into a black screen with a blinking “underline” cursor, in the upper left portion of the screen, as it doesn’t see grub to boot into the peppermint os. I have tried it twice and same results. First i selected update with installation and codecs listed below installing pre updates as stated. If i try to install it beside a windows OS, it says it will create swap and root for the peppermint OS. If this is so, where is it getting the space from on the drive? I am puzzled as i have installed many different OS’s and this is giving a little problem. I love your OS and would like to use it. If i use peppermint 8 OS first release, will the updates go through to make the current 11202017 release? Thanks! I tried installing Peppermint besides other non-Linux OS and it booted to the same thing. Of course it boots fine from the live usb i am using to install it with. I haven’t had this issue with Fedora, Ubuntu, Puppy, Manjaro, Deepin, or many others. It is just puzzling as i downloaded distro on a fast connection. Love Love Love! Thank you so much for all your hard work, just loaded it as Dual boot with the dreaded Windows 10, fall creators update which had trashed my Linux Mint updates & then messed with grub on my Mint Xfce 18.3 ‘Sylvia’ dual-boot. So happy with Peppermint handling the Win Creator boot issue, and allowing my Peppermint to update seamlessly. I freaking love Peppermint, both the candy and the operating system. Great work guys/gals! Please never stop developing this amazing little OS. Um, why did you switch default web browser back to Chromium again, instead of Firefox Quantum? Hi Willow, As this is a respin of Peppermint 8 we didn’t ‘switch’ back to Chromium because Peppermint 8 originally shipped with Chromium as the default .. Quantun wasn’t out when Peppermint 8 was originally released. We are considering swapping back to Firefox again for Peppermint 9 though, because recent versions of Chrome/Chromium have removed the “Always allow” option for flash content breaking the ability for users to create ICE SSB’s for sites that rely on flash content. i rely on google services, like gmail, docs, photos….so i personally prefer chromium. I am not sure which other distro has default chrome….where can i find this info? As far as I’m aware no distro should ship with Google Chrome preinstalled by default, if they do they’re likely leaving themselves open to a lawsuit. Google don’t allow the use of Chrome without the user first having to agree to an end user license agreement prior to installation (which is why it can only be downloaded from the Google website after agreeing to the EULA) .. they have to do this because they don’t own the intellectual property rights to all of the included proprietary code, it includes IP owned by third parties such as Adobe (amongst others). Chromium on the other hand is open source and doesn’t contain this third party software so can be distributed freely. Beautiful, practical, fast. I have a little problem, though. When I double-click (or right-click and Open) on a “notepad” like text file, nothing happens. I have to right-click on file, Open with… Other application and OK to launch the Text Editor (default app for such files, which is otherwise very appropiate). Any solution to fix this? Hi Hother Chillian, try this .. Next time you select “Text Editor” in “Open With”, click the “Set as default” button at the bottom before clicking the “OK” button. Oh, it is the default one. Even changed the default app and then changed back to Text Editor, to be sure it is correctly registered. But no effect. Maybe you can check this yourself and include a fix in a future update. And, talking about the future, a script that could upgrade the system after each new release would be really great. As I’m sure you know, some Ubuntu-based distros developers are already doing this. Text files are associated perfectly (with xed, the default text editor) on all our test systems, did you keep a home folder from a previous install ? Now my Pentium 4, 4 Gb ram, flies like a rocket. No, it was a fresh install. Sorry, I didn’t intend to transform this place in a bug report forum, just thought it is something quick and simple to solve. I’ll do soon a new install on another computer and we’ll see after that if the problem persist. Thank you and don’t stop doing what you’re doing so well. I went through a long experimental journey two years ago when coming into what I refer to as “Linux Home” (Distinguishing PC Linux from the marvel which powers the internet),attempting to find one which fills need, feels like it belongs on my pc, represents my personal values/ character/etc, is fun/easy to use, and is buildable as I grow in knowledge. Well over twenty distros, in so many varying DEs. I was first in lust with Pepper back @ 6.2, but treated my search for “MY” Linux-Home as I would date; one awesome night doth not a life-tale make. I dated many, but none exclusively. I even tried each on varying platforms, from a bad azz i7 with 32gb ram, usb 3.1, etc, to a macbook air I dubbed my “Peppermac”, as well as chromebooks and this old travelmate I’m typing this from. I’m matured from my lust-puppy state; I’m declaring devotion towards Peppermint. I’ve upgraded this old travelmate to hyperx 960gb drive n 8gb high-speed hyperx ram, and carried Peppermint ‘cross the threshold from usb-installer to her Home on that sweet 500 plus dollar ssd. Thanks to everyone who struggled and labored in love to build and improve this OS. oh…can I upgrade to the newer version of 8, or have to reinstaal that iso? I was first made aware of the fantastic Peppermint OS while searching YouTube for a Light weight Linux distro to run on an 11 inch Dell laptop. I was very intrigued by Peppermint and decided to give it a try. I am so glad I did. The work and skill that the developers have put into this project is very impressive. I love this OS! I will be making a donation shortly to support the developers. Peppermint OS is truly wonderful. Lightweight, easy to install and use, stable, and nice on eyes. Installed it on a 32bit netbook that used to run WinXP, works perfectly and also in Japanese. would be great if i can get android emulator on it. Hi arwin, there are Android emulators for Linux such as Genymotion, Andro VM, and Googles own official Android SDK which contains an emulator. Excellent distro. Had an old Pep 7. Like this even better. Good luck and keep up the great work. Hi ray, Any theming is always subjective and will never please everyone, some love them, some hate them. You wouldn’t believe the in team arguments we have over default themes and wallpapers, Luckily they’re easily changed. Excellent distribution and it runs fine on old low-end PCs. However, I need to point out that it is often very hard to install multifunction HP printers. It would be nice if a printer auto-detect function was available, as it is the case with Ubuntu 17.10. While installing and setting up HPLIP, Peppermint is not included in the list for automatic configuration and user password is not accepted, so installation fails. That is a major drawback for us. Thanks for replying. I know that it is available in the default repos but once I run it, there are a lot of missing dependencies, which it fails to install. When we run hplip setup it asks which distro we are using, claiming that Mint is the closest. However, in our case, it fails to install, and as some other users have also reported, hplip does not accept admin password to install the required plugins for AIO HP printers. Maybe Peppermint could be added as a choice in HPLIP setup options, as it is the case with Mint, Ubuntu. That would make things a lot easier and convenient. Or, if that is not possible, maybe the feature of automatic detection of printers could be added, as it saves a lot of effort and time, especially in professional or educational institutions that use Linux. This feature is available in Ubuntu 17.10.